The trouble with big ticket restaurants is that the hype takes away from the experience. The first Le Cirque opened in Manhattan 36 years ago and after conquering New York and Vegas, its owner, Sirio Maccioni, launched his newest baby at the formidable Leela Palace Hotel, Chanakyapuri in the capital. Delhi loves adopting all things foreign and Le Cirque is no exception. The Delhi version of a stiff upper-lip NYC fine-dining restaurant fails to impress with its interors. The buff wooden panelling and carpeted look is uninspiring and there is no hint of the circus which once made it legendary in the United States and gave it its name. Looks aside though, the food shines. In its original form, Le Cirque is an Italian restaurant serving French food, but given the Indian palate, the French influence has been pared down dramatically and the chef experiments with classics instead, giving them a new name along with a new identity, The original Le Cirque classics find themselves highlighted in red in the menu; the dishes in black are executive chef Mickey Bhoite's own creations. I began with the duck prosciutto which is a delicate confection of well-done duck that dissolves on the tongue, leaving behind hints of caper berry, apple and aged balsamic. The softness of the produce and the tart flavours of the sauce give it a distinctive appeal. I went with the paupiette of black cod (the New York version served sea bass) for mains. Fresh cod was served with a Barolo wine reduction, on a bed of potatoes and leeks. The fish had a mahogany crispness that elevated the dish, but leeks are an acquired taste and I can't say I enjoyed the beautifully cooked version at all. My companion opted for the Wagyu rossini plated up with foie gras, cream spinach, asparagus and truffle jus. Foie gras may be banned on the pretext of animal cruelty in some American states but Indian activists have (thankfully) not yet demanded the same here. While the meat was cooked rare and was possibly the best Wagyu I have eaten in India, the foie gras added the wow factor to the dish. In dessert, the floating island Le Cirque, served with berries and cream anglaise was a neither-here-nor-there kind of confection and nothing else on the menu looked particularly inviting. Le Cirque, Delhi, still riding on its foreign antecedents, needs to come into its own. Till such time as that happens, it invites you to be part of this very elite circus where owner Maccioni's signature dishes compete alongside Chef Bhoite's winning experiments. Mumbai's Mahalaxmi race course now boasts the Indian fine dine Neel, yet another interpretation of kebabs, curries and more. Tote on the Turf at Mumbai's Mahalaxmi race course with the ingenious experiments of Rahul and Malini Akerkar is now an Indian specialty restaurant, Neel. The address and look and feel of the restaurant remains the same: spacious, all-white, and an incredible 25,000 square feet divided into a lounge, al fresco seating and dining section. Only the upholstery has changed to a more functional kind. 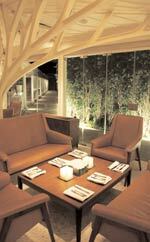 The Tote Bar still occupies the two floors above the dining area and the service remains impeccable. Sipping on a sparkling orange splash cocktail is a good way to spend a cloudy monsoon afternoon. The cocktail is smooth and clears up the palette in-between mouthfuls. The food menu is kabab heavy. The options are plenty and there's an abundance of flavour and aroma. Kebabs like the inhouse specialty, Nadru (lotus root) ke shami kabab is delicious, especially with its rich tarter dip. The Kesari khumb tikka, tandoori mushrooms with saffron marinate are outstanding as is the juicy and tender Kakori kabab which has a host of peaty aromas. While most Indian meals are heavy, Neel's brilliance lies in that the main course actually feels light. The Lagaan ka murgh is reminiscent of Lucknowi bylanes whereas the Kabul ki dal, though delicious no doubt, lacks the richness of true Frontier food. The biryani is actually light and rice grains don't stick to each other, a sign of being wellcooked. If you have the appetite, enjoy the specialty rabdi ice-cream or the Parde me khubani, which is a baked apricot halwa layered with rasmalai. Neel provides the kind of innovation to its meals that high-end restaurants do and relatively provides value for money. With Neel, Indian cuisine still has a chance to be considered fine dining.